ANDS strongly recommends a central integrated infrastructure or hub, so that institutions can track their data collections as intellectual assets. 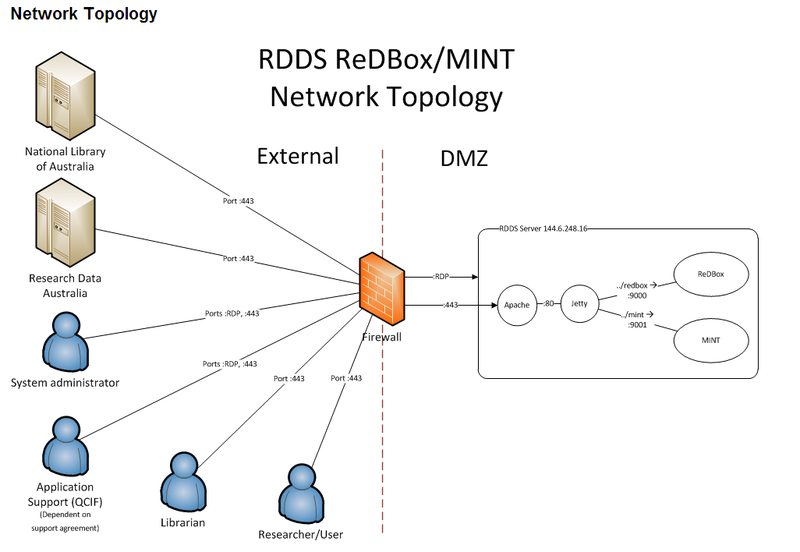 ANDS has funded the development of various metadata stores software solutions (VIVO, ReDBox, TARDIS). 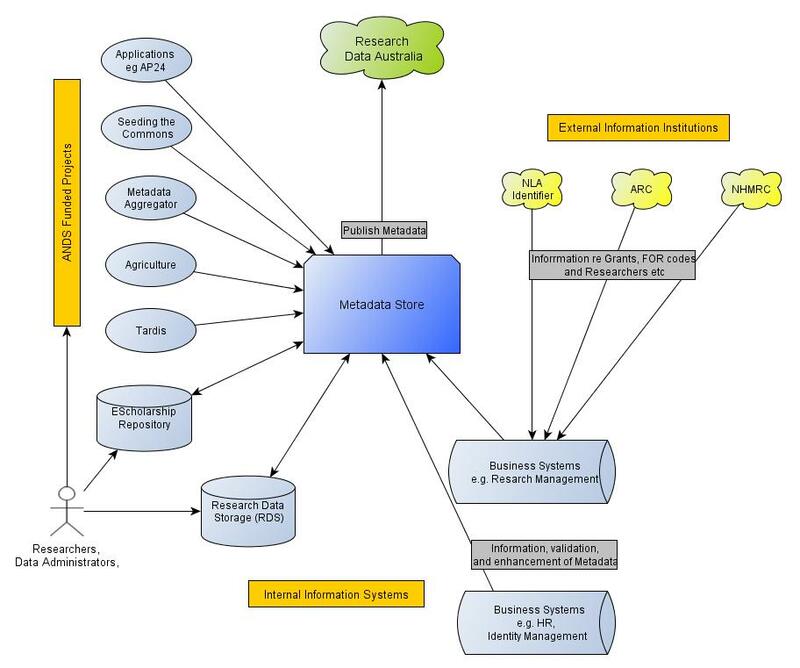 Different metadata store solutions have different ranges of functionality and fill different niches. ANDS‐funded solutions have not been mandated. 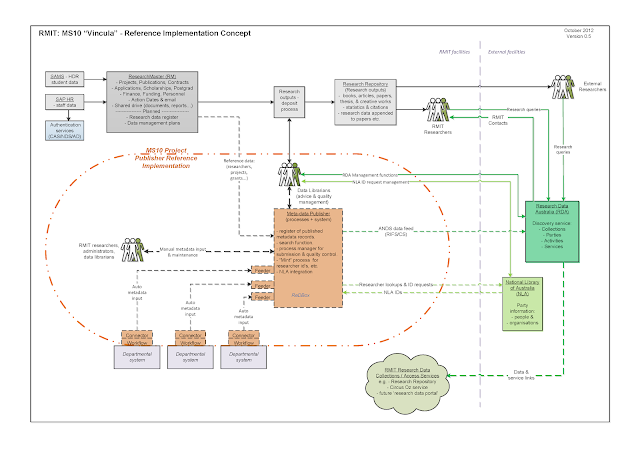 Nevertheless, to ensure sustainability, we recommend that the various solutions available are being fit‐for‐purpose and able to be integrated into enterprise systems. To this end, institutions are strongly encouraged to enter into consortial arrangements in order to maximise the value of the available funding. See this table of comparison [Google doc] to see which 4 universities have chosen to deploy VIVO and which 15 universities have chosen to deploy ReDBox (UQ and the CSIRO are building their own and ANU is using the ORCA software supporting Research Data Australia - RDA). Summary: With the Metadata Stores Project funded by ANDS, Griffith eResearch Services will further implement and develop the Griffith Research Hub to build on functionality already implemented in previous ANDS and Griffith funded Projects. 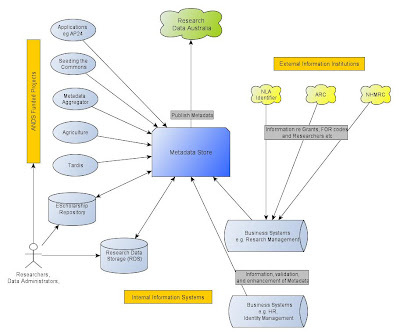 Full scale creation, management and workflow of metadata records which will be fully operationalised. eResearch staff will be employed fulltime for 12 months from February 2012 to develop the system. A Project Manager will be employed to work with eResearch Staff, Scholarly information Staff and Office for Research Staff to develop and implement functionality. Some of these staff will be devoting time to the project in-kind. All mandatory deliverables will be met, including an operational feed to Research Data Australia, inclusion of metadata records describing research activities and datasets from numerous Griffith faculties, implementation of Parties and Activities services, an operational workflow, and implementation of robust storage and management of metadata. A number of optional deliverables will also be met as outlined in the proposal. 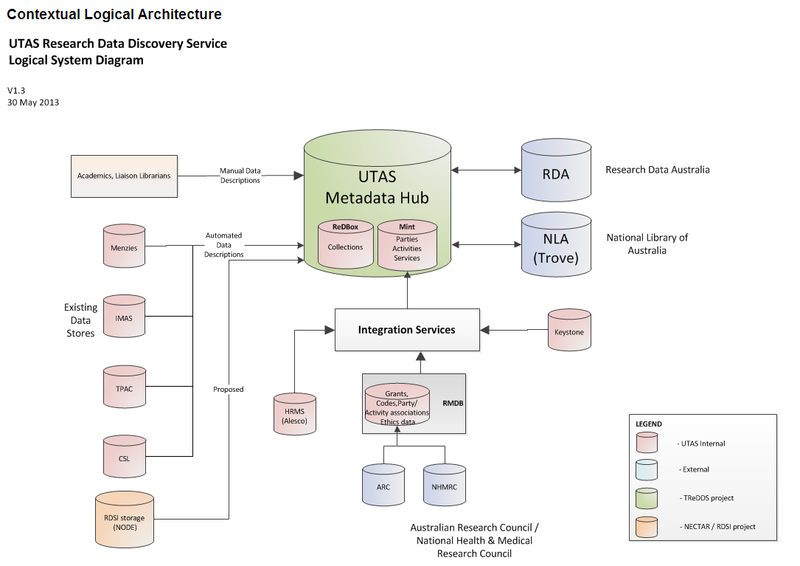 Summary: This project will develop, test, configure and deploy a UQ metadata store for research data collections that aggregates metadata from existing sources of truth and feeds metadata to ANDS Research Data Australia, the ARDC Party Infrastructure, and the UQ Operational Data Store. The project will also develop a specification of portal requirements for a UQ Academic Portal, and analyse potential software solutions meeting those requirements. JCU will share information and project documentation with the research data management community, as well as share discussions about the development and delivery of the optional deliverables to increase overall coverage and project efficiency. Initial investigations suggest that a deployment of the RedBox application will best complement La Trobe University’s “sources of truth” applications which include Research Master and a VITAL/Fedora repository. 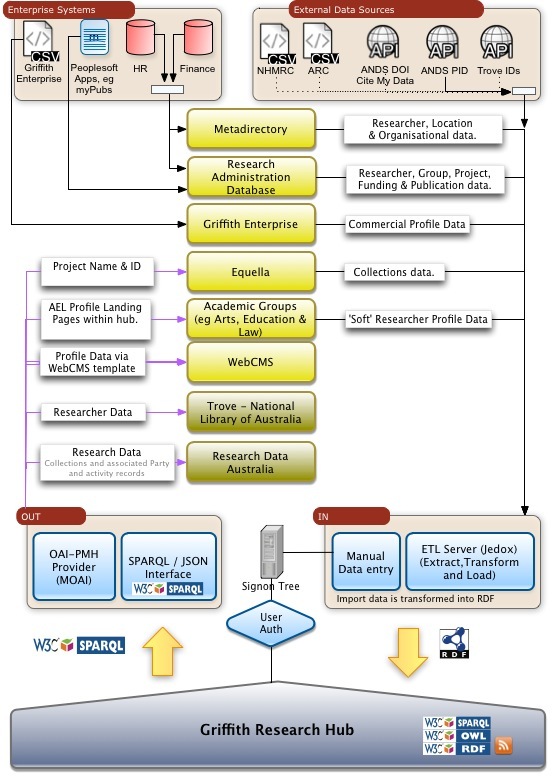 Summary: This project will build on the previous work funded by ANDS and other bodies that has produced a number of domain-specific metadata stores with feeds to the Australian Research Data Commons (ARDC). This ANDS-funded work will be integrated with a major University project to build a comprehensive research data storage and curation system. 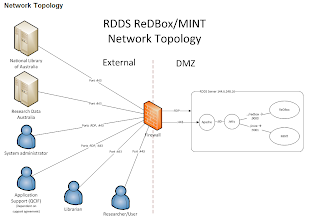 The focus of this ANDS-funded component will be to: create a central metadata store, provide for populating this with metadata from the implemented domain-specific metadata stores, provide a framework for the inclusion of new domain specific metadata stores, and to provide a mechanism to publish metadata to the ARDC. The broader ITS project will provide an overall architecture, business processes and on-going support, basic services and the deployment of reliable, sustainable and extensible storage infrastructure. Phase 1 of the program aims to establish the infrastructure required to create an Institutional Research Data Registry, by creating a reusable solution for developing an institutional harvest point for the ANDS data commons on the VITRO platform. Summary: The Macquarie University Metadata Stores initiative will aggregate the institutional metadata information for research collections. 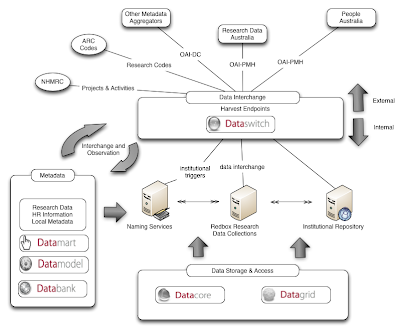 As an aggregator the system aims to interconnect data collection, which have native storage and provide the over-arching meta-information to facilitate discovery and usage of research information. This initiative extends another ANDS project; Seeding the Commons SC11, which is driving management of data and research collections with the pilot implementation of a Metadata store. The pilot has evaluated a number of metadata store software solutions enabling easier decisions around the technology choices. Additionally the pilot has setup many of the policies and procedures for meta data collection within research collections. The project will formalise the implementation, configuration and creation of inter-system connectors for the gathering of data and publication to ANDS. Summary: Leveraging existing ANDS projects in data capture (DC), seeding the commons (StC) and metadata aggregation (MA), as well as existing university administrative systems, the project will provide infrastructure in support of research. It will provide an enterprise-wide research data management solution by bringing together existing components, filling gaps, providing a metadata store for research data collections and a system for managing metadata created through StC. In support of strategic planning, the system will enable reporting on published collections. Metadata management for unpublished collections will not be within scope, but will be recommended for attention post-project. Summary: The project proposes to create a Tasmanian Research eData Directory Service which describes key elements of a diverse range of data stores held by Tasmanian research entities. 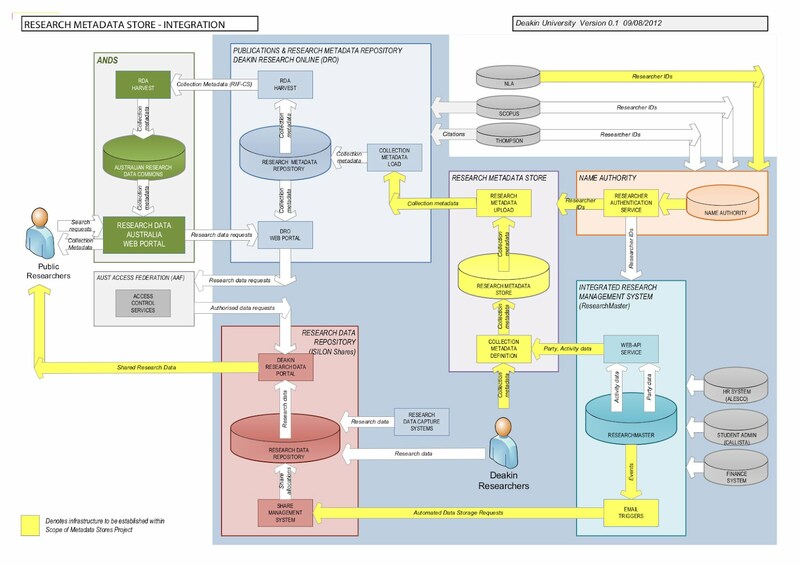 This directory service will interface to national metadata stores and hence provide a more extensive and coherent discovery service to data assets held within the state. Management of the service will be coordinated via the UTAS library, through curation, archival, harvesting, and publishing frameworks. Tasmanian research entities have a long legacy of producing extensive high quality data across a broad spectrum of research disciplines including Physical Sciences – agriculture, fisheries, and ore deposits, marine sciences – Antarctic and south oceans; medical sciences – health populations; Arts. These datasets will form the basis of the curation, harvesting, and publishing frameworks through the diligent identification of key data attributes and the population of these attributes into the metadata store. The TReDDS will also conform and where possible exceed national standards for metadata store interoperability and information exchange – which the long term strategy of contributing toward a national metadata store fabric. 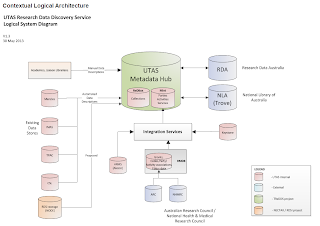 The University of South Australia’s Research Metadata Store Project will implement an enterprise metadata store solution. The project will seek requirements, assess existing sector solutions, specify a software solution, develop or implement a system, and interface to both internal and external research discovery services such as Research Data Australia (RDA). The system will be developed as an enterprise class metadata store that will be an enabler of complete, high quality, compliant and accessible metadata for UniSA’s research activities. 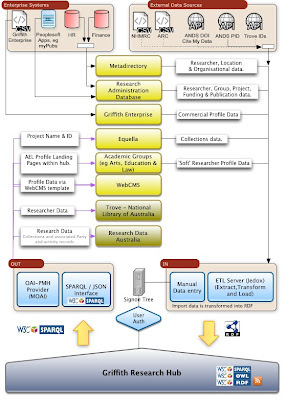 The system will facilitate ongoing contribution to various Australian Research Data Commons (ARDC) repositories allowing discovery, reporting and reuse of UniSA’s research activities. The project will be directed by UniSA’s central IT unit in close collaboration with Library and Research units. UniSA will also seek collaboration from Adelaide and Flinders Universities locally, and the wider sector, to obtain key learning opportunities for code sharing where possible.